AMS student art is on display in the ​Robert Shetterly’s Americans Who Tell the Truth exhibit at the YMI Center. The 7th grader's art was inspired by the citizen heroes they found the most interesting and relatable to, then the students wrote about them and drew portraits of the “hero” of their choice. As an example, a student chose Martin Luther King Jr. as a civil rights leader to research and draw. Every seventh graders art has been chosen to appear in this gallery walk, as well as the eighth grade colleges. The 8th grade took self portraits and made a collage surrounding our faces, telling/showing about who we are, how we see ourselves, and our goals in life using magazine scraps. The art will be displayed at the YMI Cultural Center (39 Market St., Asheville NC) starting on Saturday, September 30 going until Nov. 19th. Go support our awesome middle schoolers by checking out the exhibit! In our Spanish class they are learning about “El Dia de los Muertos”, which is Day of the Dead. They are participating in the event by making sugar skulls and pan de muertos. Sugar skulls are often made to decorate the “ofrendas” which means offerings. These skulls are generally used for decorating purposes but they do make mini sugar skulls that you can eat! Pan de muertos means bread that is eaten in Mexico and Central America during “El Día de los Muertos”. Pan de muertos is a sweetened soft bread that is shaped like a bun. They are often decorated with bone shaped pieces. I went into the classroom where they were making sugar skulls, and when I walked in I saw trays of mini sugar skulls. The mini sugar skulls are usually the ones that you eat and enjoy! Instead of the “Pan de muertos” they had nachos and some type of apple tea. In the nachos there was a chicken mixture and queso that I got to try, it was really delicious! I didn’t get to try the sugar skulls, but a student said they just tasted like sugar. I talked to two 7th grade girls about what they thought about making sugar skulls and eating nachos. Daijah Elliot said “ I am very excited about making sugar skulls because I love food, I loved eating the nachos!” Jenaya McDaniel said “I feel like making sugar skulls is going to be fun because we get to decorate it on our own.” Great job, Spanish class! Bibbity Bibbity Bop: Theatre class gets improv lesson! The Asheville Middle School Theatre program welcomed a special guest during club time on Monday, October 30th. Local comedian, Mondy Carter, volunteered to come and teach an improv class for the theatre club. Mondy is an improv actor; he has worked with many different groups and now works with the local “Lazoom” comedy bus tours in Asheville, as well as being part of an improv group called Reasonably Priced Babies. ​He arrived with an array of games and activities for the students to do in order to warm up and get used to a more professional attitude towards acting. It was clear he is very knowledgable on the subject and not to mention rather hilarious! At many times he had the classroom full of laughter, all while the students gained a lot of focus and intention in their acting. The games included “What are you doing” as well as “bibbity bibbity bop” and a hand focus game. They taught the students to be confident in their stance and actions, and to be intentional with where their energy is directed. Thank you Mondy!! It’s cookie time! Ms Monson's class made sugar cookies as a sweet treat. The atmosphere in the room was stressful and yet very peppy! I got to try one of the cookies and they were delicious! Crunchy on the outside and gooey on the inside. Everyone seemed to be having a great time from mixing, rolling, and putting them in the oven. I spoke to a student in Ms Monson's class, Tavon Lytle (7th), and here is what he had to say “It only took 25 minutes to make the cookies. They were so easy! We put extra sugar on the cookies and it made me very hyper!” Overall, it seemed like a very fun class! Why did you start the program? The PBIS committee started the AMS Teacher Incentive Program. We wanted to reward staff that were going above and beyond the call of duty. What are some of the incentives? Some of the incentives include gift certificates from local businesses, tickets to shows in the area, we've even had ROOTS Hummus donate tubs of hummus, and Dynamite Coffee donated bags of awesome coffee! Once a week we recognize one staff member that exemplifies awesomeness at AMS. It could be in the classroom, somewhere in the building, on the field. We know that everyone in the building is doing their best all the time, but it’s a challenge to reward everyone all the time. Who are some of the teachers? It depends, it varies by grade level, content area, etc... on Friday we announce the winner for that week on the announcements. Thank you Mr. Hooten for all of the information, and thank you to everyone who has donated! Our teachers deserve to be recognized! Cougar Pride: How do you ROAR? Everyone feels this cougar pride in a different way, and they show it differently too. One student says they wear their cougar wear around town and that shows their pride and tells people where they go to school. An 8th grader, Hallie Dodd, said that she “goes to all the sports games and supports our cougar sports.” Even if students don’t always feel this pride everyone has felt it in some way, shape, or form. 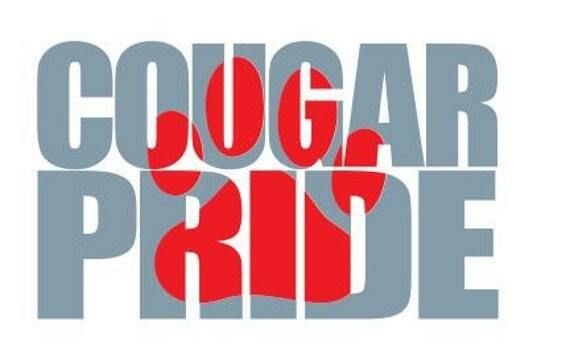 So, how do you show YOUR Cougar Pride? Pictured: Seventh graders Caitlyn, Lilly, and Audrey. On October 27th, Asheville Middle had its first dance of the 2017-2018 school year. The annual Halloween dance got students into the spooky spirit for the upcoming holiday. Tickets were $3 if purchased ahead of time and $4 at the door. Proceeds of the dance went to the seventh grade Dollywood trip. Pizza and snacks were sold by the door with the help of the PTO. Although it was a Halloween dance, dancing wasn’t the main reason why people bought tickets. Food, costumes, and even just hanging out with friends were all why people bought tickets. “The costume contest was fun,” seventh grader Raina Markulis told us. Asheville Middle will continue to have dances to raise money for the benefit of our students’ education. Hope to see you there!